A Sutoro miliitaman holds his rifle in Derik in northeast Syria. Credit: Karlos Zurutuza/IPS. QAMISHLI, Syria , May 4 2014 (IPS) - Malki Hana says his men are afraid of cameras. “Most of them are army defectors and they may easily get in trouble,” says this commander of a mostly unknown armed group in Syria. From his headquarters in Derik, 700 km northeast of Damascus, Hana, 34, briefs IPS on his militia comprising almost exclusively members of Syria’s Christian community. “We started to organise ourselves as the regime pulled out from the northeast and the Kurds took over the region. Sutoro – ‘protection’ in Syriac language – is our alternative to the chaos gripping the country,” says the commander, a former mechanic. There are discordant voices within the community. In July 2012 Syrian Kurds took control of regions in the north of the country where they are compact. So far they’ve managed to keep distance from both the government and the armed opposition. Translators are sometimes necessary. “We do not speak Kurdish and some of them are Kurds from Turkey who do not speak Arabic,” he says. Pre-war census figures suggested an Assyrian Christian population about 10 percent of the total population of 23 million. The east has been a safe haven for Christians – especially those fleeing the war in neighbouring Iraq. But many parts of Syria have turned into a lethal trap for non-Muslim minorities. The United Nations says more than two million Syrians have fled the country since March 2011. It is uncertain how many of them have been Christians. Many Christians have reportedly sided with the Damascus regime of President Bashar Assad during the crisis, but there are discordant voices within the community. Among these is the Syriac Union Party (SUP) established in 2005. It remained underground until the new scenario in the northeast allowed them to surface in places like Qamishli, 600 km northeast of Damascus. SUP chair Isoue Geouryie laments that many of his kin have vowed for “security” rather than “rights”. “Both Hafez Assad (former president and father of the current president) and his son denied us our legitimate rights because they did not even recognise the existence of the Syriac people in Syria,” Geouryie tells IPS. He says he has no fear of reprisals even though many of his party members are in prison. Easter processions in Qamishli are famous all over Syria. But the political situation here is unparalleled: government forces are still in control of the airport and the city centre, where portraits of the Assads, including a large statue of Hafez, remain untouched. The suburbs and the rest of the northeastern Jazeera region remain under Kurdish control. In late January this year, Jazeera declared its own autonomous provincial government which includes Kurdish, Arab and Syriac representatives. At the militia headquarters in the west of Qamishli, local commander Luey Shamaaon puts the full number of Sutoro militiamen “around 400”. He confirms the existence of a fellow Christian group aligned with Assad. 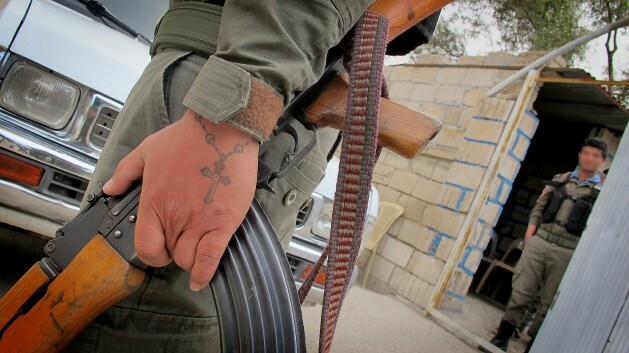 According to local information, Christian militias allegedly loyal to Assad boast a different logo and identify themselves on their uniforms and their vehicles as “Sootoro”. Given the constant refusal of the Syrian government to grant a visa to this reporter, the only way into Qamishli was after crossing the border from the Iraqi Kurdish region without consent from Damascus. IPS was therefore unable to check such information about other Christian militias independently. “Of course we have contact with them but only at a personal level. When I take off my uniform I can talk politics with anyone, and in a most civilised way,” a Sutoro militiaman who didn’t want to disclose his name told IPS. Despite the ongoing conflict, it is evident in downtown Qamishli that ties remain in place among the local Christian community with differing loyalties. Lara, a 21-year-old Christian university student says at one of the many Internet cafes in town that she feels comfortable with the Sutoro and their Kurdish allies. “Were it not for the YPG (Kurdish acronym for ‘People’s Protection Units’ run by Kurds), Islamists would have wiped us out all long ago,” she tells IPS. Al-Qaeda linked groups, many of them entering the area through the Turkish border, have maintained a siege on the region since autumn 2012. She is struggling to chat online with a relative in Sweden. “Most of my family is there now,” she adds with a sad smile.